Being a successful marketer is less about being lucky and more about understanding buyers’ psychology. In today’s hyper-competitive world, you need to know what makes your customers tick and how to influence their purchasing decisions. The same applies for content marketing, which marketers are using largely to drive traffic, build an audience, improve engagement levels, generate leads, and convert them into sales. If you can understand the buyers’ psychological principles and the science behind the branding and marketing trade, nothing can stop you from creating more compelling content that can drive higher growth for your business. Understanding these key psychological principles can help you take your content marketing efforts from good to great, while changing your audience’s behavior in ways that benefit the business. 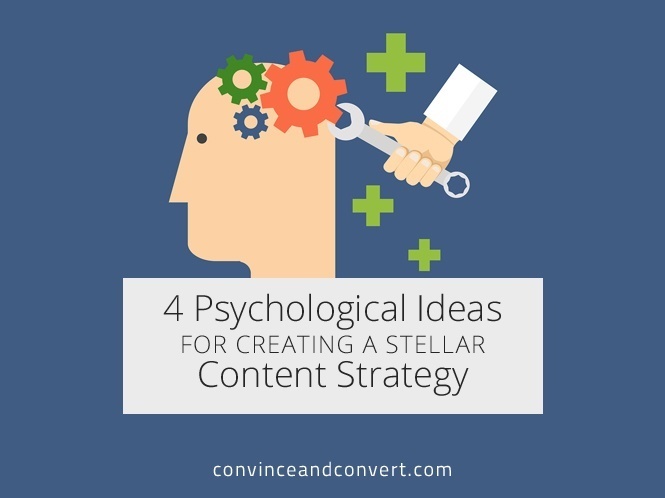 Here are four psychological principles you need to leverage to craft a killer content marketing strategy. When you form an impression of one aspect of an organization or a person, it resonates to the greater whole. This is the basic premise of psychologist Edward Thorndike’s “Halo Effect.” From a marketing perspective, the halo effect impacts all brands to some extent. When you believe a brand offers a great product line, you automatically expect them to be similarly competent in all their other pursuits. For example, if you believe L’Oreal offers amazing skin care products, you will inevitably expect them to provide equally good makeup, hair care, and other styling products. The halo effect also applies to your content marketing. How? When you have created a positive impression on the market by means of thoughtful content, that impression translates to your whole business. The key is to project authority on the topics you cover in your blog posts and webinars in order to bolster your credibility. Who will question Guy Kawasaki if he says, “There are 5 million people who will buy anything Apple makes,” even though many believe Apple Watch is just a fad? It is his expertise in the subject that gives him such authority and credibility. You, too, can use the halo effect to your advantage. All you need to do is highlight your areas of expertise. Once you establish your authority on those topics, you can leverage them to bolster your credibility and authority on other topics as well. Information Gap Theory, in its simplest form, leverages the psychology of curiosity. The human mind becomes curious whenever there is a gap between the information we want and the information we know. The theory was developed in the early 1990s by George Loewenstein, who suggested that a gap in knowledge usually triggers human minds to take actions in order to discover the information what want to know. A number of brands are using this strategy in their digital marketing campaigns to attract users. Steve Jobs, for example, was the master of exploiting consumers’ natural curiosity to the company’s advantage. He would hint at a product demo or leak a prototype to create a hype about the product before its release. Sony, too, used this psychology to their advantage with their “The Arrival” series of mysterious advertisements back in October 2012. Content marketers can use this psychological idea, as well, to create curiosity within their audience. Trigger the audience to explore more before delivering what they are looking for. The best first step in sparking their curiosity is to create eye-catching and attention-grabbing headlines. After that, focus on your opening pitch. It’s all about getting people to read those first few sentences. This psychological theory is about how a positive action is reciprocated by another positive action. If you are friendly to someone, then according to the theory of reciprocity, they will also be friendly to you. Brands are leveraging this theory to build loyalty. They are giving their customers inside news, helpful blog posts and articles, a gift of value, free e-books, or special offers on their blog and social media channels for free. And in response, customers are liking, commenting, and sharing these posts, increasing the brands’ reach. Remember that the content you share should be insightful, compelling, beneficial, and of course, free to read and use. You wouldn’t want to miss out this one. A part of scarcity marketing theory, “Fear of Missing Out” (or FOMO) states that people give more value to things they fear are scarce. Retail and eCommerce brands are notorious for using FOMO to manipulate buyers’ purchasing behavior and decisions. Amazon’s “only 2 left in stock – order soon” is just another way to use FOMO to encourage users to make purchase decisions. It is basic human psychology to want something more when you can’t have it because of limited quantity or time. In terms of content marketing, use FOMO to tell your readers that you are offering “rare” and valuable content. For example, if you are offering an e-book, make it free to download for a limited time. The goal is to create a sense of urgency. As a marketer, you should focus on creating content that wows your audience. The best way to do that is by understanding the psychology of your customers and using it to your advantage. When your focus lies on the thoughts and behavior of your customers, they are more likely to trust you and be loyal to your brand.